One of the main benefits of using a popular java script library, such as jQuery, is the incredible number of available plug-ins that will kick-start any development project. Today we are going to build a custom gallery that scans a folder of images and outputs a slick gallery, utilizing PHP, CSS, jQuery and the jQuery Lightbox plug-in. There is no need to download the plug-in - I've included it in the demo files, so grab them and get on reading. We start off with our XHTML front-end. And that is basically all there is to it. Note the highlighted area - this is where we put our PHP code, that will generate the gallery images. Now lets go through how this is done. The idea is simple - our PHP back-end is going to scan a folder that we've set up with our gallery images, and turn it into a fancy CSS & jQuery gallery. The great thing about this strategy is that it is incredibly easy to set up a gallery, and adding images to an existing one is a charm - just dump them in the gallery's directory via FTP and it is ready to go. if(($i+1)%4==0) $nomargin='nomargin';   //the last image on the row is assigned the CSS class "nomargin"
By traversing through the files in the directory and skipping the non-image files, we output some XHTML code for every image . This code (lines 28-39) consists of a div container, with a CSS class pic (and in some cases a nomargin, more on that later), and we set its background to the image file via the style attribute. We position the image in the center of the background by specifying its position to be 50% 50%. This centers it both horizontally and vertically and thus shows only the middle part, that fits into the div container's size. This creates a nice thumbnail, with no need of actually resizing the image. This works best with images with smaller resolutions, so you should consider resizing those 10 megapixel photos before uploading them. The div contains a hyperlink which is linked to the image and has a title of the image filename. Both these attributes are used by the lightBox plugin to generate the lightbox gallery. So by renaming the file, you can change the caption that shows under it. You may wonder what is the point of that nomargin class? Every image in the gallery has a right and a bottom margin. But this means that it is not possible the last element of each row to align with the right part of the heading div and it looks amateurish. So we assign this special class, which clears the right margin for the last element on each row and gives us a proper alignment. Everything is set up, but we still have to give it that cool look. On line 1 we include the lightbox plugin's CSS file, which styles the lightbox that displays the images. On line 2 we include our own CSS file. Line 4 is where we include the jQuery library from Google's CDN. Later come the lightbox plugin itself and our own script.js file. Now we are ready to put the finishing touch. The lighbox() method takes an object as an optional parameter. The only reason we provide any parameters is that I changed the default location of the plugin, putting it in a subfolder /lightbox which aids for a cleaner file structure. Unfortunately the images that the plug-in uses become inaccessible and have to be provided manually. With this our gallery is complete. 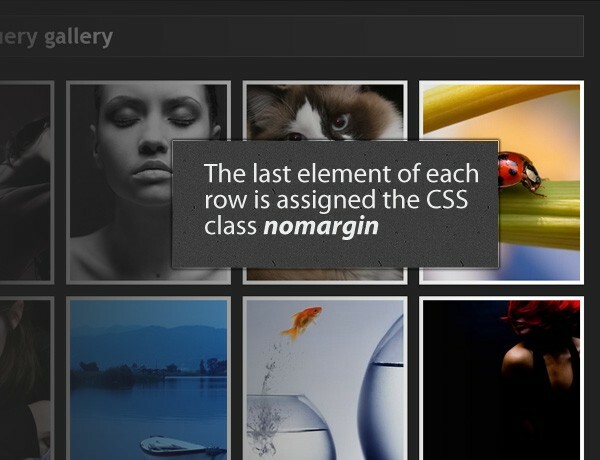 In this tutorial you learned how to create a stylish image gallery with the help of the jQuery lightBox plug-in. You can use the example code into your projects and you are free to modify it in whatever manner you find appropriate. You can as well use it as is and add a gallery to your site with minimum modifications needed. This is what I've been looking for, for a very long time. Great stuff, no one has something this easy to put together. But I wish to add jquey pagination to this forcing it to show specific amount of images on 1 page..
// you'll need to change the last parameter from 'demo.php' to '/'. That is about it. You would still need to style it though. I have one question. How to load ''Gallery'' as external page into div element. I tried to load css and js files in main page on several ways but no success. All I've get is nice looking thumbnail gallery with no actions. When click on the thumbnail it's open image as new window. Sorry, forgot to mention that i use Ajax. This will re-initialize the lightBox gallery. Great code. Very useful to show how php can make this gallery dynamic. Bookmarked. can you change the entire PHP code with what you have explained in that comment and provide me..? Thanks for the response Arjun. However I think it would be better if you try it yourself. It would be a great experience. A great deal of the learning curve consists of spending time on your computer, trying to make something to work. I tried it. But the thing is it is displaying only images as per the count of the page in which we are viewing..
By the way you are covering some good tutorials as per the new trends. Hey that jQuery slideshow in your homepage looks really cool.. I'm thinking of making categories for gallery by making folders inside the basic image folder and that directory should be the name of category.. The gallery wasn't made with categories (or albums) in mind. The easiest way to do it would be to physically copy the gallery files in the sub directories and modify them to show a strip with links (or thumbnails) to all available albums. Really like the simple tutorial and the implementation. Can you point me to where/how I might put in some hyperlinks on the images (thinking of using it for a product catalogue - and want users to be able to click image to go to product page) and still keep the next / previous functions? Thanks for the comment, Tim. This will not be an easy thing to do - currently the gallery is just scanning a folder of images and is unable to store additional product data. In order to provide the functionality you want, you'll have to put the gallery in a database, in which instead of pictures you'll show products. In the DB you'll have to add fields for a product image, title, description, price and so on. Later instead of listing all the files in the directory you'll SELECT them from the database and show them. Also you'll have to consult with the LightBox plugin's documentation and build some AJAX-es to show HTML data instead of a gallery image. Just what I'm looking for thanks alot !! A very very cool site. In recent times, I found the very constructive and unique site that is yours. I like the design a lot, the photos I am using are a little larger than average. They expand and look great, but I was wondering, is there a way to have the thumbnails scale down some to be able to see more of the overall picture? Dave, unfortunately the images in the thumbnails are displayed as a background and it cannot be scaled down. One solution to your problem would be to use different, smaller, images for the thumbnails. You'll have to replace the url() part with your thumbnail. Because the thumbnails have the same names as the original images, you'll only have to change the $directory variable here to your thumbnail directory. but it didn't work. Any ideas on this? "<div class="pic '.$nomargin.'" style="background:url('.$thumbsdirectory.'/'.$file.') no-repeat 50% 50%;">"
Thank you very much! For me is very hard learn all this I'm an illustrator, but I'm making progress. I have a doubt, how can I set to the big image automatic adjust for any resolutions? Thank you again! Thanks Martin, for the easy to implement script! could you please upload a new source file that grabs the thumbnails from a different directory with scaled down images?? great tutorial i realy love it. and these are 3 diferent folders. kan i first make a selection of the different gallerys so that wen whe select one we can go furter? also is it possible to use mysql for the storage? After a long work i compiled this tutorial to make my site dedicated to orkut.com users.. I used this php code too list directories and from your tutorial I think my site is up..
Great tutorial! Worked great! It seems that the images are put into a random order? Any thoughts on how to put them in, say, name order? Thanks again - great work! If I understand what you are trying to do, you'll have to make a static entry page, with thumbnails that lead to the respective galleries. After this, on every gallery you'll have to put a link that leads to this static page. Something like a "Up one level" link. The images in the gallery are currently ordered by filename. If you want to change the ordering, you can put leading numbers in front of the filenames. The tutorial is great, but I'm having the same problem Brandon had: the images are put in a random order, even though they are named as 1, 2, 3, etc. How could I possibly solve this? 01tiger.jpg will be the first, tiger.jpg will be the second. I have been working with your PHP Gallery and just love it, although I am having a lot of trouble getting the pagination to work. I am not sure How to really set this up. Could you provide a short tutorial on how to extend the gallery with this pagination function? Hello, i am trying to limit the number of images it dispays accross tghe page (columns) to 3 from 4.
rather than after all the other stuff in the while. Other than that, it all worked perfectly. AWESOME tut! just what I was looking for! Is it possible to use highslide instead of lightbox? I believe its a bug of some sort. Could you help debug it please. Awesome site! Nice work dude! A good demo, thanks. This could be enhanced with semantic HTML - using an unordered list (in this specific demo) and removing target="_blank" either completely or adding it dynamically with the jQuery (the target attribute has been deprecated in XHTML1.0 Strict, mind you). The title attribute on the anchor tag isn't particularly useful either - it merely repeats the link text and should a visitor be using a screenreader with titles turned on, they will get to hear the word or phrase twice. The purpose of the title attribute is to further describe the link. Also, by using the Cascade in CSS you can remove the repeating class="pic" and easily style everything from the containing div's ID. Hi there! Love the gallery, so easy to implement, no thumbnailing or coding required, just FTP to the gallery folder, awesome! One problem though, the same as Brandon; the images seem to be displayed randomly... I've tried numerically sequenced files, alphabetically ordered, FTP in reverse order etc, nothing works...! I would love a solution if anyone had any ideas, thanks in advance! i am working for a while on a portfolio-site (i'm trying to) and don't get it together... so here's my question: Is it possible to do a galerie (who looks like this one at first). A click on an image and the thumbnails are sliding apart, opening a content-area (accordeon-like). in this area a jQuery Carousel is showing more content. Can anyone follow my explanation? Is this possible at all? Hi all! Excellent gallery, but i have a problem, the same as Greg - random order of pictures. how did you solve the order of pictures? Hi Alex, how did you order the pictures? why not just post it ? Alex, can you post the code here??? Or just simply the changes that you made to make it works? Which gives ideas on how to sort the images. I keep getting the die error, "There is an error with your image directory!". I believe I am linking correctly. Is there another possible problem? wondering if you ever figured out the problem you had with accessing the gallery directory. I am having the same issue you have with the error "There is an error with your image directory! " Stunning - and easily configurable into an existing site. Awesome work. Great gallery - clean and simple. And also thanks to DMJendor for posting the link to sort out the alphabetical sorting issue - nice one! I'm a beginner-intermediate in PHP but after reading all the comments here I got it working with no 1 error that I fixed quickly. I now have a working gallery with pagination and have the option (commented code) to use alphabetical order as well. Thanks for everyone who helped and I hope I can be of help to anyone as well. this gallery is perfetcly what i was looking for :OD greaaaaaaat !! woohoo ! Could you help please ? i put the page in the 'website' field. Great script! Just a quick one..Is possible to create spaces between words in the title?? Ex . "Great_Script.jpg" TO "Great Script" replacing underscore with space??!! Where do you place the code for the _ underscore replacement? Martin! what a useful code! i used it in my website to lauch the CrossSlide Java Plugin... But.. I was wondering... what modifications shoud I do to get it to read the Subfolders as well?? and assign it to a variable! All i need it is to have anothe variable to adress 1 level subdirectory! it would save my life!! thanks a lot in advance! I really like the ability to read from a directory, yay PHP! Your script is amazing and simple. I'm a front end designer using an instant website service http://www.tmw.to and it was amazing to be able to iFrame your page in to the site after tweaking the CSS and adding the alphabetical ordering from the other comments on this page. You are all very appreciated and thank you. Spaces between words in the title? But it does not work..There are other ideas? Thanks for this amazing tutorial. I have a really simple question. I want to change the language. How can I change "Image 1 of 20" part? I inspected the code so many times, I just can't see it. All of my images are saved as PDF's. Will this work with PDF's? can get the thumbnail to display now, can't get the original file to display in the lightbox?? is basically an inline CSS styling statement, therefore by adding the CSS background-size statements we can get the iamges to be reduced and fit (in theory) into any size of 'window' that we create in the CSS file that is associated with the gallery. Can this handle nested folders? Is there a way embedding your gallery with another page? Displaying the images on a sidebar for example. I use chrome. I have tried the demo and it works great. When I click a image I see the image open up correctly. When I download the files and place them on my webserver when I click a image it opens in a new window as just the image. If I try this from Firefox it works fine. I have looked around and can't not seem to find a answer why I can't get the image to open correctly instead of in another window while using chrome and also ie. Any suggestions would be greatly appreciated. Hi - did you find answer to your question about opening the image in new page - this happens to me also. I see the images but I do not get the lightbox when I click the image or the next option - I just get the image on a new tab?? Awesome Script, never find a useful one for my site. Thanks a ton ! Do you have a responsive / mobile first version of this? That would be amazing. Thanks for posting the demo, nice. I tried a few other directories also with no luck. there's a problem with my code and its been bothering me for an hour now, for example, i declare 2 pictures per page($imgPerPage = 2;), the problem is each and every time i click the next link from the first page, which will be "page 2", it will show the 2 previous picture from the first page. But pages 3 up to the last page is working fine. Hi there I was just wondering if it's possible to sort the images by the date and time in which they were created? Yes you can sort the image ordering in that way, you would do the sorting in the php file and use get or post to send the order type to the php script if you wanted to allow ordering on the user side.